Shenzhen Ugee Technology Development Co., Ltd. was founded in Shenzhen, China, in 1998. Since then it has been involved in the growth of the tablet technology. A center for sales and marketing was established in Guangzhou, China, in 2003. Soon after, the company started selling pen compatible tablets throughout the country. The touch technology in Ugee pens was able to detect up to 2018 levels of pressure by 2014, and up to 8192 levels were supported by 2019. 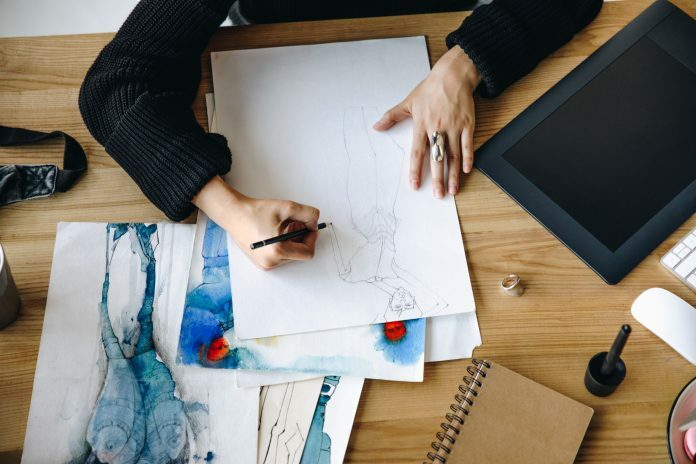 The company has also launched an online drawing school to help young digital artists hone their craft. Ugee’s product distribution has expanded, and now it operates globally supplying the technology that drives many e-signatures, animated films, digital artworks, and other designs. What Is the Ugee Tablet? Ugee offers two different types of tablets, which they have labeled as “Graphic Tablets” and “Pen Display” tablets. The difference in these two options comes down to how user drawings are displayed. The “pen display” type of tablet shows what the user does with the included stylus directly on the surface of the tablet itself, emulating the feeling of pen or paintbrush on paper or canvas. The graphic tablet, on the other hand, is a surface with which the stylus can interact; however, instead of displaying the pen’s strokes directly on the tablet itself, the image is displayed on a connected computer through the use of a digital illustration software. Each of these different types of pen tablets can be used by any graphic artist, and usage often comes down to preference between the types. If the artist has a predisposition to one style or the other, don’t worry because we will be covering both styles of Ugee tablets in the scope of this article. What Does the Ugee Tablet Do? 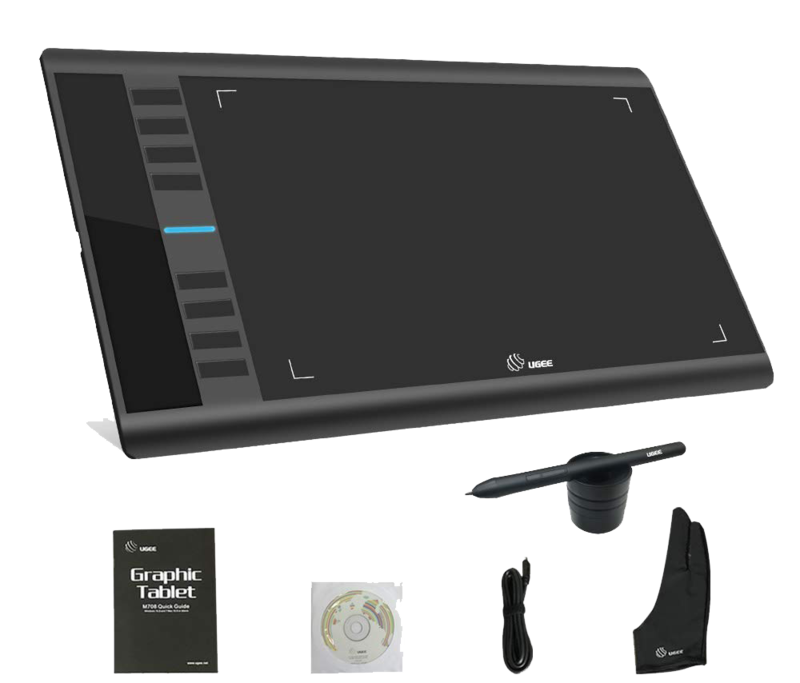 Graphic tablets are input devices that let users emulate hand-drawing with a stylus. Almost everyone has used a stylus when creating a digital signature when making a transaction, and that is what the Ugee tablet can do. Graphic tablets differ from standard tablets such as the iPad because graphic tablets are designed specifically to receive input from the stylus. For that reason, they will not be able to download apps that one might expect with a computing tablet. Many digital artists find working with graphic tablets to be a pleasant experience and a great alternative to a regular pen and paper or another physical medium. How Does the Ugee Tablet Work? 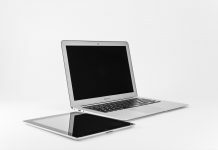 Passive tablets use technology that is focused on the use of electromagnetic inductions as the horizontal and vertical wires of the tablet are simultaneously transmitting and receiving data. An electromagnetic signal is received by the stylus; this changes the tablet to enter receiving mode as it begins to read the signal from the stylus. Many newer tablets also couple this with pressure sensitivity which can manipulate different parameters of the input, such as creating broader strokes. Active tablets have compatible styli that contain all of the electronics necessary to transmit a signal to the tablet. Usually, they have larger pens due to the electronics, as well as the necessary inclusion of a dedicated battery. Since active tablets are constantly ready for pen input, instead of constantly switching modes, there may be less jitter. Optical tablets use styli that include small digital cameras with pattern-matched imaging on the tablet. Acoustic tablets have sound generators that are incorporated into the design of the styli, and the acoustic signal can then be received by two microphones on the tablet itself. More advanced applications of acoustic tablets can recognize input in three dimensions. Capacitive tablets operate by electrostatic or capacitive signals. 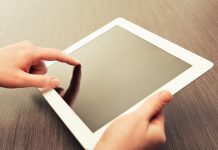 Capacitive tablets are not only able to detect when the stylus is directly on the tablet, but also when it is hovering over it. 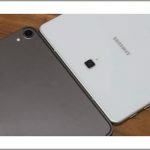 Where Can Users Buy the Ugee Tablet? Graphic tablets can usually be purchased in most retail locations that sell consumer electronics. They can also be purchased from a wide variety of websites. We believe that it is important to provide accurate and honest information when it comes to the purchase of a new tablet. For that reason, we find it necessary to fill potential users in on our review process. First, we thoroughly research the product down to its most minute detail. Then, we compare the product specifications with the thoughts and opinions of consumers who have already purchased the product. In this way, we can develop a clear understanding of the true nature of the tablets in order to provide information on the best Ugee tablet of 2018. We also provide a list of the pros and cons of each item to help develop an honest picture of each tablet on our list. Ugee tablets generally can range anywhere from $60 to $600, depending on the model and style of the tablet. The Ugee M708 offers a large screen that lets users flesh out all of their creative ideas in one location. This model provides a fluid drawing experience with little to no lag. The stylus can sense 2048 different levels of pressure, providing the ability to easily control the details in any drawing, and the paper-esque surface of the tablet gives users a tactile experience that closely emulates natural drawing. The device is also built to support both left- and right-handed artists. The device is compatible with both Windows and Mac OS. 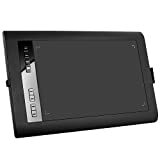 The Ugee M708 is compatible with Adobe Photoshop, Photoshop, CC, Illustrator, LightRoom, Corel Painter, Autodesk, MAYA, Pixologic ZBrush, Macromedia Flash, Comic Studio, and SAI. The tablet is designed to accommodate left-handed artists as well as those that are right-handed. The stylus has an eight-hour battery life when fully charged and comes with eight different nibs. The Ugee M708 is an affordable option for digital artists. Some users may prefer a tablet that displays the image on the drawing surface. 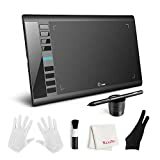 High configurations, 10 x 6 inches large drawing area, 2048 levels pressure sensitivity, 5080LPI resolution, 230RPS report rate. 2048 levels pressure sensitivity pen, with mouse and eraser functions, like a real pencil drawing when sketching on the screen. 8 User-Defined express keys, can be customized the functions in the driver. 4 Non slip mat on the bottom of the tablet, much more stable, can avoid slipping. Good compatibility, can compatible with various drawing software, for example Adobe Photoshop,Photoshop CC, Illustrator, LightRoom,Corel Painter,Autodesk MAYA, Pixologic ZBrush and etc. 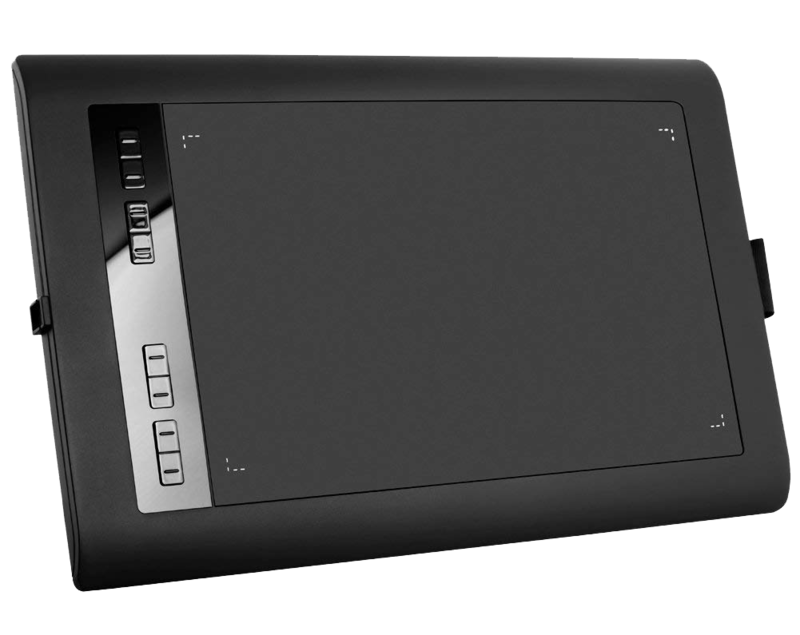 The Ugee HK1016pro is equipped with a 10-inch by 6-inch drawing area and offers eight physical buttons that can be customized in order to tailor the digital drawing experience to the user’s personal needs to perfect their workflow. The tablet itself includes an anti-slip rubber grip on the bottom surface which makes it easy to hold for long periods of time. The 2048 different levels of pressure sensitivity can give user’s art even greater detail, and the tablet is compatible with both Windows and Mac OS. Large drawing area prevents damage from repeated sites of pressure that can occur on smaller surfaces. 2048 levels of pressure sensitivity allows even greater detail. Compatible with Adobe Photoshop, Corel Painter, Z-brush, Comic Studio, Smooth Draw, Illustrator, Manga Studio, and more. Some artists may prefer pen display tablets. The Ugee 2150 features a large 21.5-inch display in 1920 x 1080 resolution. The tablet includes 2048 levels of pressure sensitivity and contains a dual stand for maximum support and a stable drawing experience. The device is also equipped with multiple different inputs, such as a USB port, HDMI-in, DVI-in, and VGA-in for connecting to other devices. Quick and convenient physical buttons are located on the side of the device for easy navigation. Many different inputs allow connection to other devices. The dual stand provides stability for working at any angle that the user prefers. Compatible with Adobe Photoshop, Corel Painter, Comic Studio, SAI, Infinite Stratos, 3D MAX, Autodesk MAYA, Pixologic ZBrush, and more. Some users may prefer the more natural experience offered by graphic tablets. Pen display tablets are generally more expensive than graphic tablets. As with Ugee’s other tablets, the 1910B offers 2048 levels of pressure sensitivity for high detail. The 1910B is equipped with a 1440 x 900 display that makes user’s art crisp and clear. Along with the vivid display, artists are sure to enjoy the accuracy of the stylus on the 1910B with no latency or chopping. Additionally, the built-in stand will ensure that the tablet is stable while the user is in creative mode. The vivid display of the 1910B allows all of the colors and detail to show through in everything that the user creates. It is compatible with Adobe Photoshop, Corel Painter, Photoshop CC, Illustrator, SAI, 3D MAX, Pixologic ZBrush, Autodesk Sketchbook, Autodesk MAYA, and more. 2048 levels of pressure sensitivity give creations even more detail. Pen display tablets are usually more expensive than graphic display tablets. After a thorough review, we would be comfortable recommending an Ugee tablet to any artist that has an interest in creating digital works. For those who want a more tactile experience, the M708 and HK1016pro are wonderful options. On the other hand, for artists who prefer a more immediate response to their actions that closer mimics natural hand-drawing, the Ugee 2150 and the 1910B should definitely be considered. The dual stands on the pen display tablets is a great feature that allows artists to work at whatever angle is best for them. Additionally, these tablets have large screens, both being 19” or more. Something should also be said about the compatibility that Ugee has incorporated into these devices. 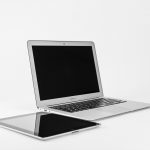 Each model is compatible with its own plethora of software, while each is also perfectly functional with both Windows and Mac OS platforms. Moreover, the 2150 even offers multiple inputs for even more connectivity with other devices. Ugee may not have the name recognition of companies like Apple’s iPad Pro, but these devices do the job for digital, graphic artists of any caliber, and may leave them without the temptation to take a moment’s break to be distracted with what’s happening online. 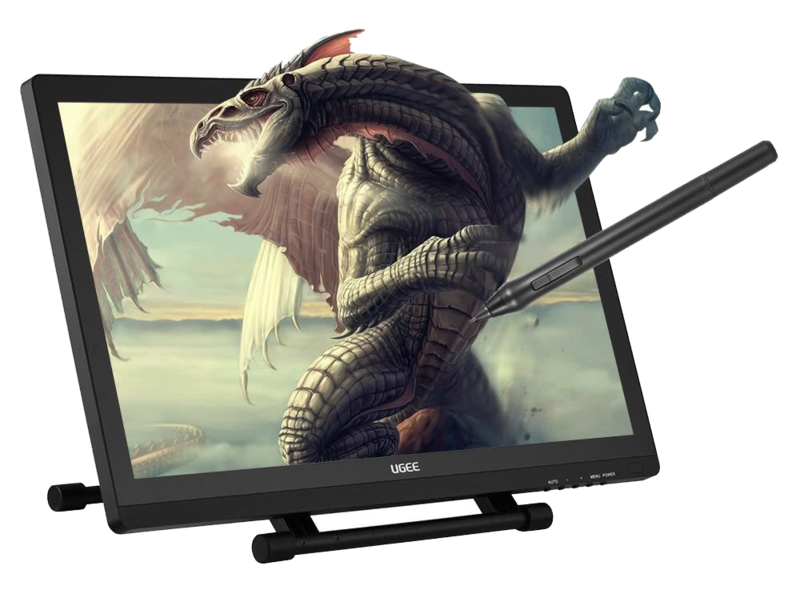 The graphics and pen display tablets offered by Ugee give artists the tactile experience that they want when they are creating digitally, and the products that Ugee sells feel more like an extension of the artist in the way that a pen or paintbrush might be. The tablets never feel like a medium that needs to be worked through in order to create something, but instead, they feel more like a part of the artistic evolutionary process. The blend of organic and digital with these Ugee tablets means that the devices are instantly familiar, making digital artists instantly comfortable. Even with the little bit of a learning curve that is required with a new device, these tablets let users work how they want to without the confines of the physical world. 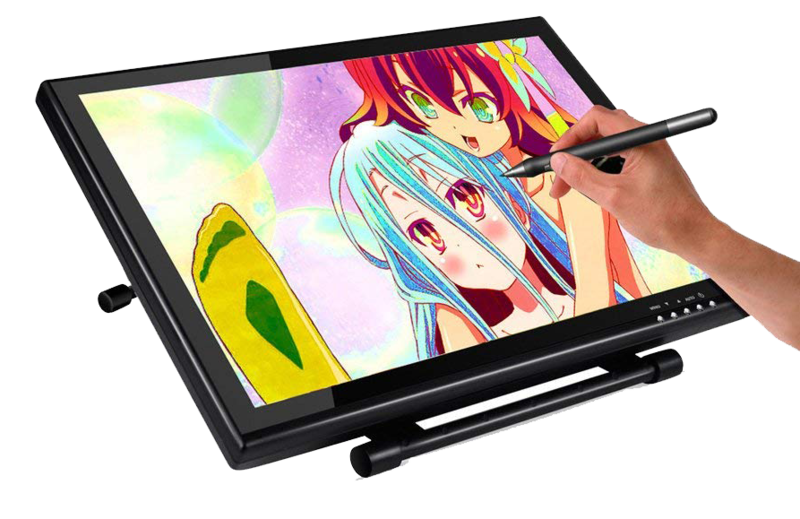 Also, depending on the type of artist that uses the tablet, they can have the ability to connect directly with existing software, or to take a pen display tablet with them wherever they go. Creation with the Ugee tablet has no walls.